We read with interest the recent published case report 'Unilateral giant Internal Jugular Vein impeding brachial plexus nerve block' by Ganesh et al. They presented a case report of a 31-year-old patient, with no cardiovascular or respiratory comorbidities, who was scheduled for an elbow debridement because of thermal burns after a road traffic accident. The anaesthesia plan consisted of a supraclavicular block with sedation. During visualisation of the target area, a giant right internal jugular vein was noticed covering the brachial plexus block. Because of the large internal jugular vein surrounding the brachial plexus, a supraclavicular approach was not possible. To illustrate this, the authors added an ultrasound image of the internal jugular vein and brachial plexus. In this image, the antero-posterior distance of the internal jugular vein is estimated 1.36 cm. Unfortunately, no measurements were given of the diameter of the internal jugular vein, nor of the diameter and cross-sectional area of the brachial plexus. If the antero-posterior measurement is correct, it means that the diameter is over 5 cm. We would like to invite the authors to add these measurements to the image as it gives a better understanding of the sonoanatomy of the neck region. A normal jugular vein in patients in a supine position measured at the level of the cricoid has a mean diameter of 17 ± 5 mm (range 13–20 mm). Why you believe that this patient has such a giant internal jugular vein? The patient was awake and not anaesthetised. Were other manoeuvres used such as a Trendelenburg position, Valsava manoeuvre or head rotation? These manoeuvres can have a significant impact on the diameter and cross-sectional area of the internal jugular vein.,, If not, other pathological causes should be considered such as internal jugular vein aneurysm, internal jugular vein phlebectasia (fusiform dilatation of internal jugular vein, creating a mass in the neck) or forms of congenital conditions affecting vascular connective tissue integrity. Aside from these vasculature-related causes, increased central venous pressure due to decreased contractility, valve abnormalities, dysrhythmias or pulmonary embolism should be considered. Another point to be addressed is the ultrasound image of the supraclavicular brachial plexus in [Figure 1] in the article by Ganesh et al. This is not a view of the supraclavicular brachial plexus. In a correct view of the supraclavicular region the subclavian artery, both the first rib and the pleura should be visualised. The carotid artery and internal jugular vein cannot be seen in such a view if the probe is placed in the supraclavicular fossa. A last point to mention is the reference the authors used. In this paper, unilateral anomalies of the internal jugular vein were found in 17.3% of cases and bilateral variations in 8.7% of the patients. These so-called anomalies were not because of a large size of the internal jugular vein but concerned the relationship of the internal jugular vein to the common carotid artery. A giant internal jugular vein as the authors describe is much rarer. Only Departmental funds were used. Ganesh V, Naik BN, Kajal K. Unilateral giant internal jugular vein impeding brachial plexus nerve block. Indian J Anaesth 2019;63:72-3. Tartière D, Seguin P, Juhel C, Laviolle B, Mallédant Y. Estimation of the diameter and cross-sectional area of the internal jugular veins in adult patients. Crit Care 2009;13:R197. Maecken T, Marcon C, Bomas S, Zenz M, Grau T. Relationship of the internal jugular vein to the common carotid artery: Implications for ultrasound-guided vascular access. Eur J Anaesthesiol 2011;28:351-5. Marcus HE, Bonkat E, Dagtekin O, Schier R, Petzke F, Wippermann J, et al. The impact of trendelenburg position and positive end-expiratory pressure on the internal jugular cross-sectional area. Anesth Analg 2010;111:432-6. Solanki SL, Doctor JR, Kapila SJ, Jain A, Joshi M, Patil VP. Ultrasonographic assessment of internal jugular vein diameter and its relationship with the carotid artery at the apex, middle, and base of the triangle formed by two heads of sternocleidomastoid muscle: A pilot study in healthy volunteers. Saudi J Anaesth 2018;12:578-83. 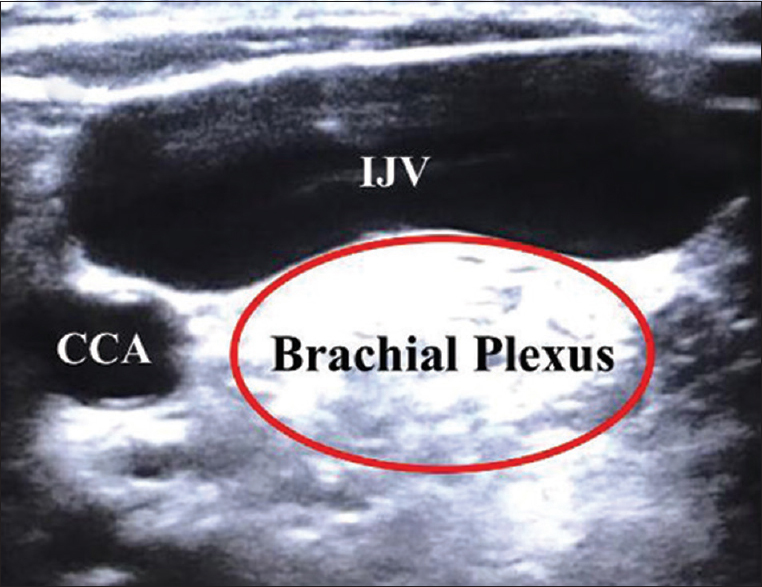 Chan VW, Perlas A, Rawson R, Odukoya, O. Ultrasound-guided supraclavicular brachial plexus block. Anesth Analg 2003;97:1514-7. Lin BS, Kong CW, Tarng DC, Huang TP, Tang GJ. Anatomical variation of the internal jugular vein and its impact on temporary haemodialysis vascular access: An ultrasonographic survey in uraemic patients. Nephrol Dial Transplant 1998;13:134-8.